a main entrance. This entrance remains locked, except to residents that have a key, card, or code to get into the building. Rather than having someone randomly knocking on your door, People can buzz you from the audio intercom at the entrance of the building and you can speak to them. Usually this will let you know who is there, but if you don’t recognize them, you don’t have to let them in. In fact, you should call the police if you have any doubt at all. Honestly, you never know. This is why security services in New York need to be friendly, professional and technologically advanced. You need to look for a 24 hour New York security service that can be there for all your security needs from audio intercoms to door locks and alarms. That place would be Hulk Security Systems NYC, serving all the 5 Boroughs with a level of integrity unmatched by most services. Not only will they adjust or install audio intercom for your building, they will look for other possible security risks and offer practical, timely solutions at any time of day. Intercom systems can be very useful, but only if they function properly. There should be a strong security lock like an electric strike lock on the front door of the building to ensure that undesirable characters don’t make it to your front door. 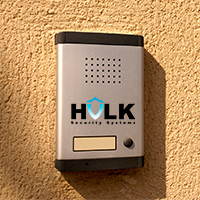 With the help of Hulk Security services in New York, you can secure your apartment or townhome in many different ways.